Chantillion is a new band featuring Jackson from Grand Buffet and some other people that I am not familiar with but have probably seen somewhere before. In mid-August, they released a single before their first show at the Spirit Summer Recess, which I had to miss, unfortunately. At least I can listen to the single. <a href="http://chantillion.bandcamp.com/track/brassque">Brassque by Chantillion</a> "Brassque" is a muscular synth-rock jam. Everything sounds so powerful, even if that isn't a word usually used to describe synth stuff. It's like Perturbator backing the Dictators. The song is kinda surfy, with hard-hitting drums, fast and surreal Dylan-esque vocals, and heavy bass synth. 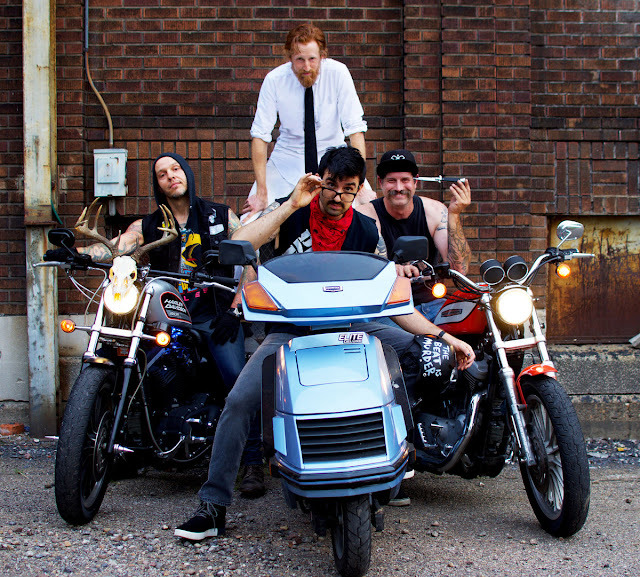 "Brassque" matches its cover art of four goofs on motorbikes well: weird and tough. My favorite part is when Jackson yells, "guitar" before a wall of heavy synths hit the listener. I don't know what the lyrics mean, but there is something about "coming back as a tiger snake" and a company man in the catacombs that recalls Poe's "The Casque of Amontillado" (also check out the spelling - Brassque and Casque). I'm excited to see Chantillion live. The only show they have at the moment, according to Bandcamp, is at the end of September in Youngstown, but I'm sure we will see more of them in the future. "Brassque" receives a Good. It is a powerful start to something that seems like it will get better and better.